As the case progresses with no clear answers, more than human life is at stake—including that of the majestic creature responsible for the attack. Ted’s search for the truth ends up leading him deeper into the wilderness than he ever imagined. 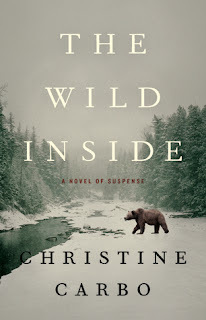 Recently I had my first taste of Montana author Christine Carbo's crime storytelling, and I enjoyed it so much I immediately ordered the first other books in her series. Starting back at the beginning with this, her debut, it's clear Carbo hit the ground running with her Montana mysteries. This is a really terrific read, with a unique and engaging protagonist - a federal agent specialising in crimes within the national parks who's never fully recovered from an horrific childhood camping experience. Carbo brings an incredibly strong sense of the rural and small-town Montana environment to her tale, infusing an exciting crime storyline with plenty of local colour and flavour. She has a keen eye not just for the natural environment but also the people who populate it. Wild magnificence and not-so-scenic communities. There's a palpable sense of the harshness and danger that lurks among the beauty and space. The dark corners and broken lives among those who live on the old frontier. The murder victim, a man left duct-taped to a tree in Glacier National Park, shot but left alive and then mauled to death by a grizzly bear, is local meth addict Victor Lance. His habit is not unique in the area, and Special Agent Ted Systead has to look into the burgeoning rural drug scene as well as many other avenues of inquiry to try and work out who could have left Vance to his horrific end. The buddy cop relationship between Systead and Glacier Park police officer Monty Harris has an interesting dynamic that feels fresh. Systead may be the central figure in the book, but all the characters, big and small, have a good sense of depth. Each has a past that comes to bear, each feels like a real person, none are just pieces merely being moved around the storyboard by Carbo. This is a texture, layered mystery novel that is about much more than just finding a killer. Carbo shows some serious writing chops, particularly given this is her debut. She brings the Montana setting to strong life, and digs into the internal and external worlds of her characters. THE WILD INSIDE is character-centric crime writing from a terrific new talent, set against a spectacular backdrop.